HOLDEN — In May, Dr. Dan Myerowitz was honored as the 2018 Chiropractor of the Year by the Maine Chiropractic Association. 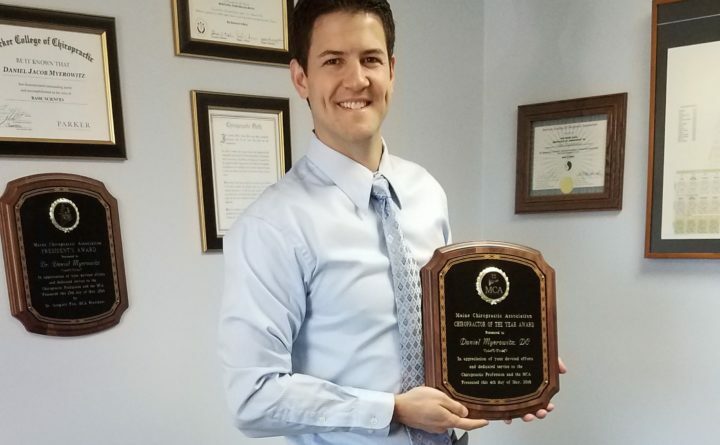 Dr. Dan is the youngest Chiropractor to receive the honor in the association’s 96-year history. Born and raised in Holden, Dr. Dan has been serving this community to get people well and keep them well naturally since 2009. The prestigious award of Chiropractor of the Year recognizes countless hours working to improve professional standards, care coverage, and patients’ access to care. Myerowitz Chiropractic & Acupuncture Clinic is located at 291 Main Road in Holden.